Little Pea is happy. There are many things he likes to do, such as roll down hills and hang out with his friends. There is one thing, though, that he does not like, and that is to eat candy as the main course every night for dinner. He struggles through, reluctantly swallowing not just one piece but five, in order to have his favorite dessert–spinach. This simple story is a twist on the age-old admonishment that children everywhere hear each evening. The ink-and-watercolor illustrations are as spare as the text, featuring a small, yellow-green pea in a loving family. Each uncluttered page has plenty of white space. Picky eaters will enjoy the subtle humor of this nice book. A pleasure to read. 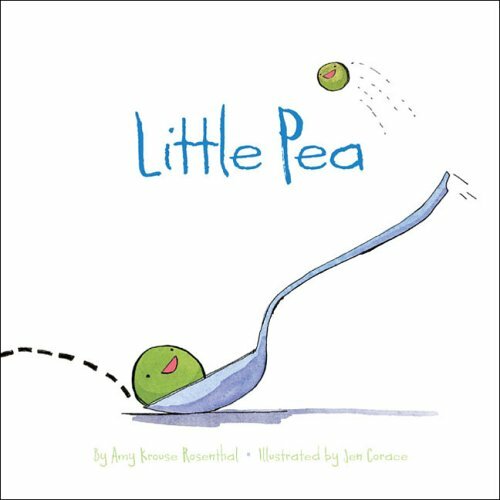 Little pea is clever. I liked it. My spouse really liked it. She is my litmus test for a lot of things because she is a child at heart (for realz). The illustration is just a neat and cute as the story line. There are no distracting scenes, its just Little Pea, Papa Pea, and Mama Pea and a classic case of fun and important lesson. You always hear "EAT YOUR VEGGIES" but have you ever heard "EAT YOUR CANDY"? Makes sense for a pea eh! We enjoyed this book and I suggest you parents trying to teach your kids to eat their veggies should get it too. So what creative ways do you get your young ones to eat their vegetables?